In the chancel of St Andrews Church are two beautifully carved cross shafts. Carved on all four sides, the smaller of the two shafts (above) dates to the 9th century and was found in 1900 deep in clay near to the church. Although significantly damaged, the sharpest and best preserved carving depicts a winged lion with a serpents head. Discovered during restoration work in the 19th century, the larger of the shafts (below) dates to circa 10th century. 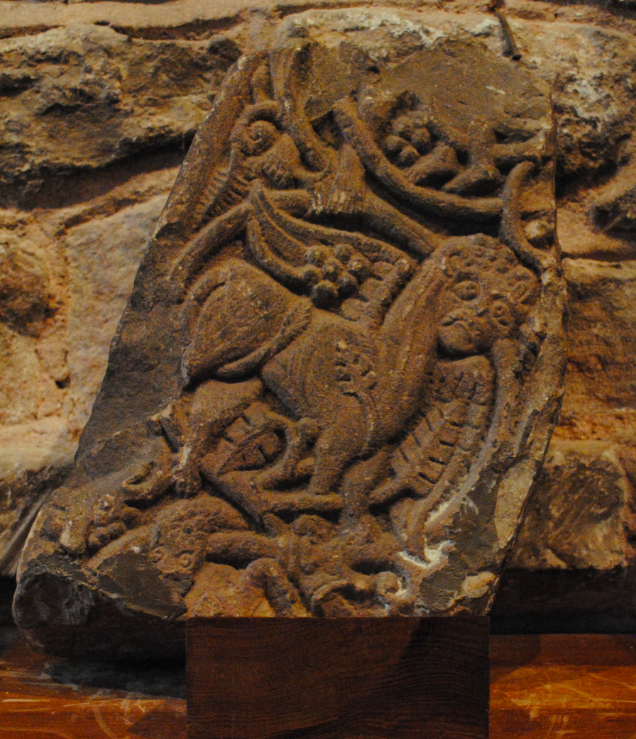 The narrow set of panels are carved with figures and beasts with hunting scenes a common theme during the Viking period. The bottom panel depicts two figures beneath a large tree and is thought to represent the story of Adam and Eve. An antlered stag with a hound on its back is carved in the panel above. Symbolising the soul being pursued by the forces of evil, the hart and hound motif was an allegorical interpretation limited to Viking era carvings in northern Britain and the Isle of Man where themes from Norse legend occur. The top of the panel is believed to depict the biblical story of Abraham and Isaac.